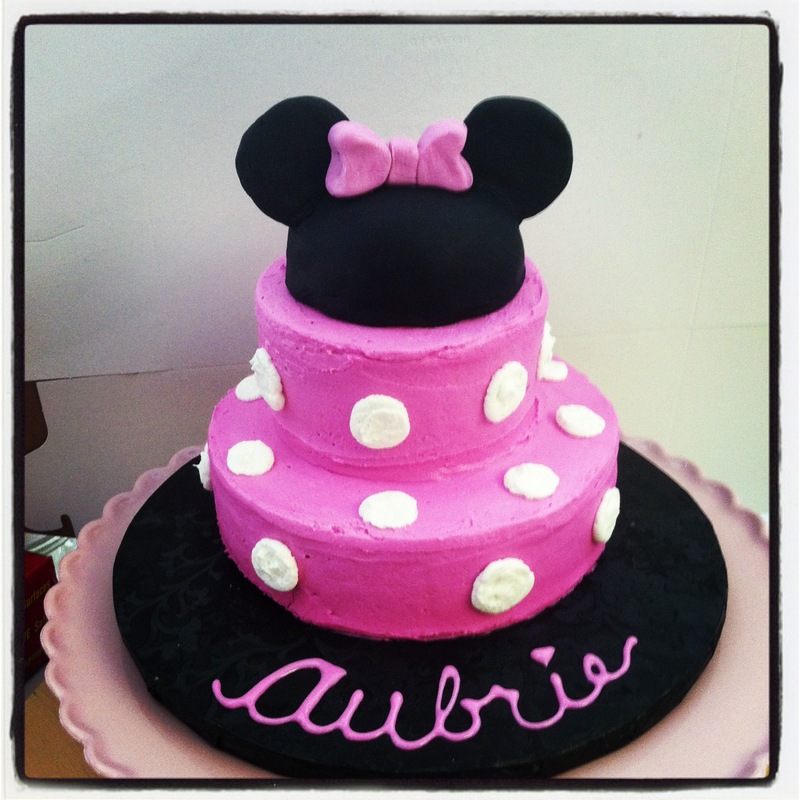 About two or so years ago, I made a Minnie Mouse cake for a friend’s daughter’s first birthday. And about two months ago, someone saw that cake and asked if I would make one for her daughter’s first birthday. She requested that I make the same smash cake, but with darker pink frosting. It’s a three tiered cake, six inches on bottom, four in the middle, and three inch mouse hat tier on top. I used a vanilla cake and vanilla butter cream frosting. The white dots are just frosting piped on and flattened out a bit. For the ears of this cake, I decided to make some chocolate wafer cookies. 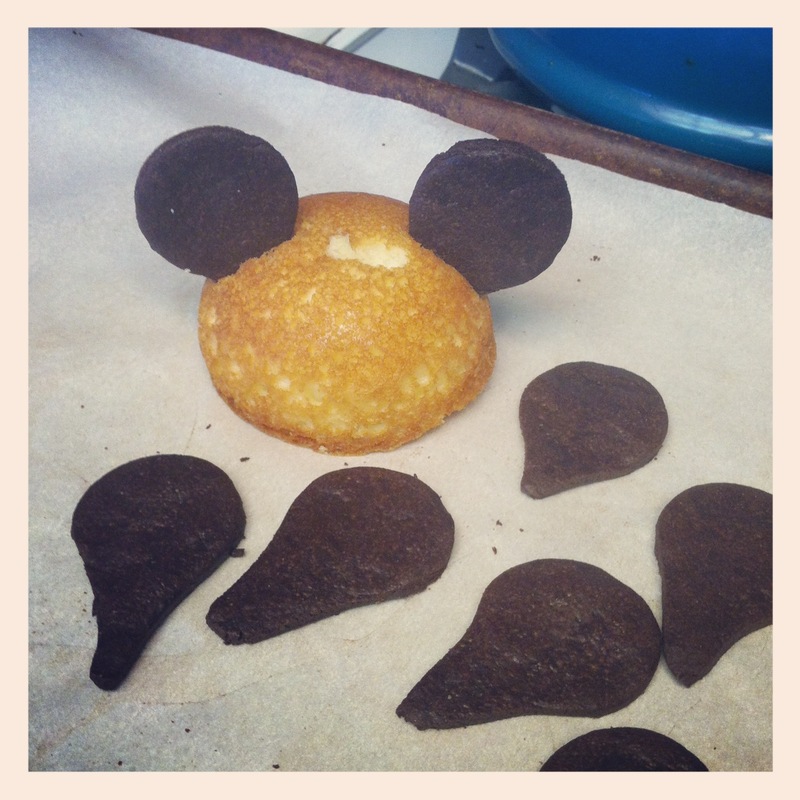 I rolled out the dough and cut it into the shape of Mickey ears with a “tail” sticking down so I could easily stick them into the cake. Let me tell you, this method was infinitely easier than trying to use oreo cookies! And, we got to enjoy the extra cookies, so it was a bonus for us. I used black fondant for the hat to give it that truly smooth finish and to make it look more like a real mouse ears hat. I made a few extra ears just in case. I ended up not needing them though because the process worked much smoother than I anticipated. Aubrie’s mom asked if I could put her name on the hat like they do as Disneyland. Because the hat was so small (only a 3 inch diameter) I couldn’t do that. But instead, I put it on the board in royal icing. How did you make the dome part of the hat! Hi there, I love that you love the Mini Mouse smash cake. I used the Wilton’s Small Ball pan for the round part of the hat.